Years ago, back before time existed, I declared Housemarque’s Super Stardust HD as one of my very favourite games on Sony’s PlayStation Network. 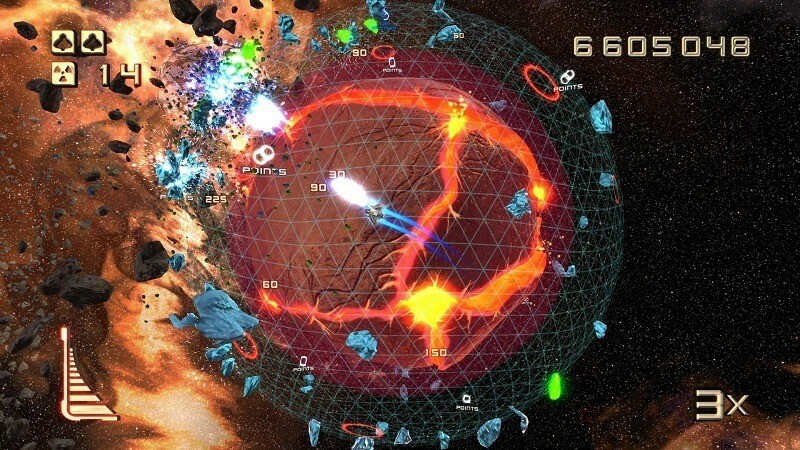 Based on the company’s earlier Amiga shooter, Stardust, it’s an arcade twin-stick shooter that beautifully melds together the core ideas of both Asteroids and Geometry Wars – and it does so with aplomb. 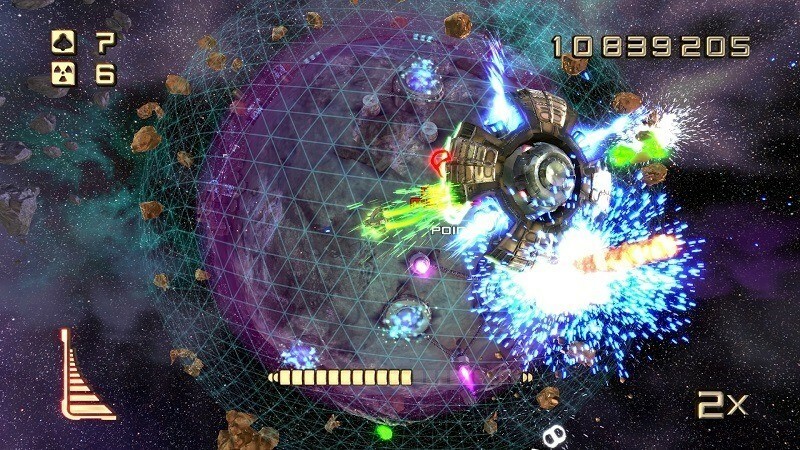 It’s back, this time on the PlayStation 4, rebranded as Super Stardust Ultra. The core game is exactly the same as it ever was – which is fine, because that core game is great. It’s relatively simple stuff: you’ve got a ship which you control with both of your analogue sticks. One controls the direction your ship moves around the spheroid you’re moving around, while the other controls the direction of your weapon. You’ll have to move around each planetoid, clearing the rocks that are stuck in its atmosphere and continue to bombard its outer surface. So very much Asteroids with a facelift or two. Here’s where it starts getting different. You can toggle between three different weapons, each adept at destroying a particular type of rock; you’ve got your green pew pew pew laser that’s great at getting rid of regular rocks, a fiery beam that’s perfect for melting down gold and another cannon that breaks down chunks of ice. Cemented within some of the rocks you continue to decimate are green bits of what looks like kryptonite. Shoot them up, and you’re rewarded with upgrades to your guns, shields or bonus points. Your goal then, is to destroy the rocks in waves upon each of the succeeding planets. Choosing the right tool for the job is key, and you want to clear each wave as quickly as possible to rack up those points. Simple enough. And then, enemies start appearing, and it starts becoming quite a bit more like Geometry wars, with explosions of particle effects; the screen nearly perpetually filled with a neon cavalcade, squadrons of enemy spacecraft of all shapes and sizes all aimed directly at you. And there’s a boss at the end of each level. Getting to the end of each is a challenge in itself, but as is usual for games of this ilk, chasing scores is where the heart of it lies. 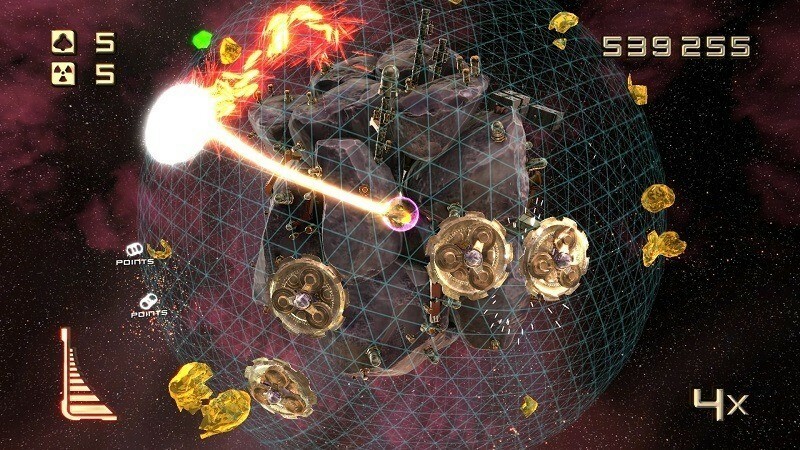 The core game is exactly the same as it’s ever been – but there are a few new additions and modes that make it worthwhile even if you already own Super Stardust HD. My favourite of the new additions is Blockade, which turns the thing in to a high-tech game of snake. Your ship continually leaves a trial of mines behind it, and you’re tasked with having to stay alive for as long as possible – all while being attacked by enemies and having rocks falling your head. It’s also got split screen and same screen co-op, and an adversarial mode for up to four players, rounding out the package nicely. Plus, there’s a feature from another Housemarqe remaster, Dead Nation, that adds an interactive streaming element; players watching your stream on Twitch can alter the way the game plays out by sending you extra enemies or giving you a much needed break if they’re not jerks. Of course, without being able to stream thanks to our internet infrastructure, this feature is useless for a majority of South Africans. 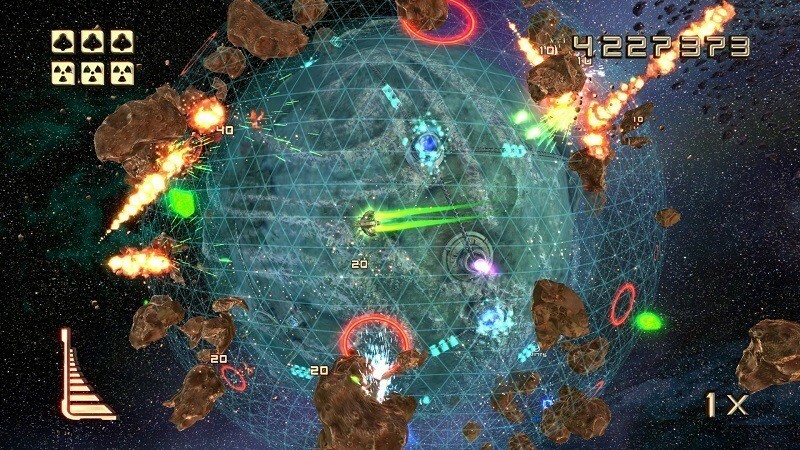 Like Super Stardust HD on the PlayStation 3, Ultra is one of the few games that actually supports stereoscopic 3D. The difference here is that because of the increased horsepower, the game still runs at a buttery smooth 60 frames per second even in 3D – and it’s incredible. The first game on the PS3 did 3D right, but it’s infinitely better now. I spent far too much time dying on purpose (Yeah…I totally meant to do that, I swear) just to have the death explosion fly right in to my eyeballs. If you’re one of the three people left on this planet who care about stereoscopic 3D gaming, this is one of those showcase games. If you’re new to PlayStation and loved the hell out of the system’s very best launch title, Resogun, you should grab it. It’s one of the best twin-stick shooters ever made, and a crowning jewel in the PS3’s digital library. It’s now been given new life on the PlayStation 4, and is still worth your time. That said, it’s hard not to find it a little disappointing. It’s worth noting that there’s no cross-buy on this game – so even if you’ve bought it twice on the PS3 or the Vita as Super Stardust Delta – you’ll have to buy it again. The game was also billed as a new entry in the Stardust series, so to find that it’s really just a rerelease with a few stapled on extra modes is disheartening stuff for older fans.